There is no reason to struggle when it comes to purchasing a fence for your home or business. No matter where your fence is going to be installed it aluminum fence panels are the solution to your fencing needs. Aluminum fencing has been a popular option in commercial pool fencing for awhile now. Do you want to know why? The answer is that not only is it simple to plan for and order online, it is also easy to install and best of all DURABLE and practically MAINTENACE FREE! Why spend an entire weekend over the summer cleaning and staining fencing when you don’t have to? Time is precious and the last thing that should consume an entire weekend is fence maintenance. Let’s start where we began in the article, pool fencing. 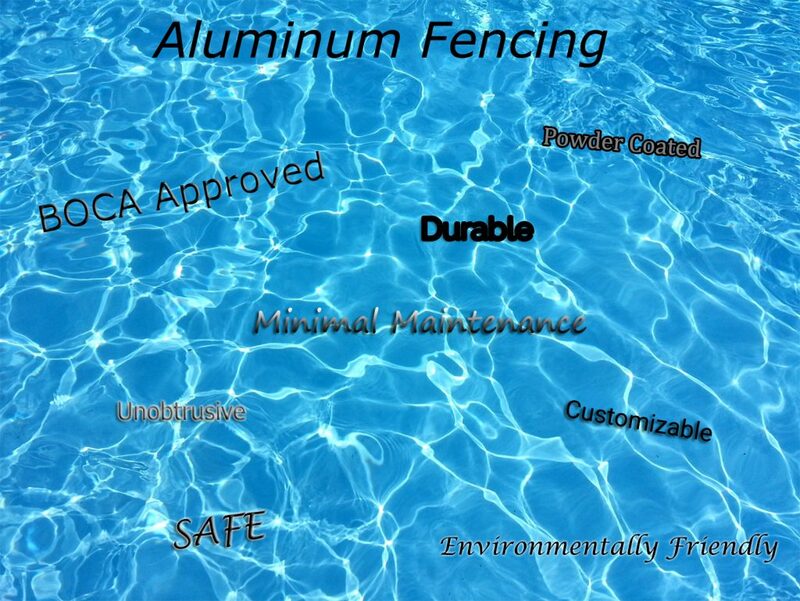 Why is aluminum the best option when fencing in the perimeter of your swimming pool? As earlier mentioned, outdoor commercial pools have been choosing aluminum for their fencing needs for years now. Pool water contains chlorine or for some salt water, both corrosive to many fencing materials. Without a doubt the fencing around your pool will get wet and needs to be able to withstand the harsh chemicals. Aluminum is coated with a powder coating that allows the paint to withstand not only harsh pool water chemicals but also the beating of most natural climates. Another reason that aluminum is used when fencing in swimming pools is because of its overall reputation for safety. In a pool setting the number one concern is safety and aluminum fencing and gates provide both. 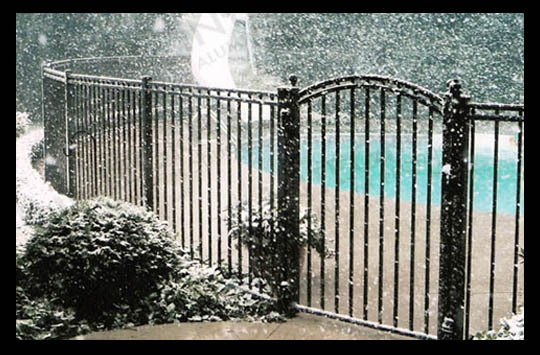 Aluminum pool gates from iFenceUSA are equipped with self-closing swing mechanisms that automatically latch. This prevents a gate from accidentally being left open. Not only do our aluminum pool gates contain these extra safety devices our aluminum fencing panels are suited to meet B.O.C.A. regulation, narrowing the spacing between vertical and horizontal pickets. This close spacing helps prevent children from climbing the fence to gain access when not supervised. The fence specialists are always answering questions regarding the maintenance of aluminum fence. Most consumers don’t understand how aluminum can look exactly like wrought iron but that it doesn’t rust. What allows aluminum fencing to stay rust free? The answer is that although the oxidation process still occurs with aluminum it doesn’t concern aluminum fencing panels because of the powder coating that is used on top of the panels and posts. The powder coating protects the aluminum from moisture. This protection against moisture creates an environment that is not favorable for rust to form, thus aluminum fencing stays free of rust. Installation is another common concern surrounding fencing. Although the installation of a fence is a large scaled job, aluminum fencing is easier than most other types of fencing naturally. Can homeowners install aluminum fencing without hiring an installation expert? The answer is an unequivocal, YES! The entire process from ordering to installation is easier with aluminum fencing. There are several online tools at www.ifenceusa.com for homeowners to use when planning for and installing aluminum fencing. The online ordering options allow homeowners to upload an image of their space and virtually plug in the different styles and sizes of aluminum fencing. Once you have established a layout diagram that you are pleased with ordering is as simple as answering a few basic questions about your landscape. Following the diagram will ensure you order the right number of posts and panels. This diagram will be included in your fencing shipment with detailed installation instructions. Do you remember those paint by number canvas’s we all painted as little kids? Yep, your fence installation can be that simple. Many customers have been blown away by the simplicity of the installation process. This is not to say it is done without some good ole fashion hard work, time, and patience however it can be done without stressful complications that are found with the installation of other fencing materials. You don’t sacrifice quality saving money on installing aluminum fencing with the DIY method. Aluminum fence panels and gates have an abundance of benefits over other materials available to homeowners and commercial users. Not only is aluminum affordable it offers durability, low maintenance, ease of installation, an abundance of options, styles, and more. For both kids and adults alike, the best part about summer is when you can spend all day in the water. A swimming pool is also perfect when you have had a long day at work and just want to cool down and relax. One area of concern for many homeowners that install swimming pools is the safety of their family including both the animals and humans. Kids naturally gravitate towards water, especially a swimming pool which is known for play however the last thing you want is for it to quickly turn into a life altering hazard. On average, 3,500 people die each year because of unintentional drowning accidents. The last thing that you want is for your family to become part of this statistic. That is why it is crucial to take the proper measurements to prevent access to your swimming pool when proper supervision is not in place. The best way to prevent access to your homes swimming pool is to create a barrier between the swimming pool and the yard. Aluminum pool fencing is easy to install, durable, and prevents access. Insurance companies require a fence to be installed around swimming pools to create a secure barrier, thus limiting the liability placed on the homeowner. The requirements surrounding pool fence vary a great deal based on the location of the pool, the insurer, H.O.A., and federal regulations. The minimum height of an aluminum swimming pool fence is 48 inches. Other regulations include, self-locking, self-latching gates, minimum space allotments between vertical pickets and horizontal bars. These requirements are put into place as a way to decrease the likelihood that the fence can be scaled hence, increasing the security of your swimming pool. Although you are wanting to block access to the pool, you are not creating a fortress that isn’t penetrable, thus the installation of an access gate. Although a gate is a useful access point in which to gain entry to your swimming pool it must also be secured when the pool is not in use and supervision is unavailable. Many policies require the gate to have special features for safeguarding your family such as a gate that swings closed (self-closing hinges) when it is not being held open. Upon closing another feature that is often required with the installation of a gate for you pool is that the gate automatically lock (magna-latch) when closed. Self-closing, self-locking aluminum fence and gate systems are a necessity in keeping your family safe. The aluminum fence that is installed around the swimming pool in your backyard has a crucial purpose, to keep your family safe and sound. 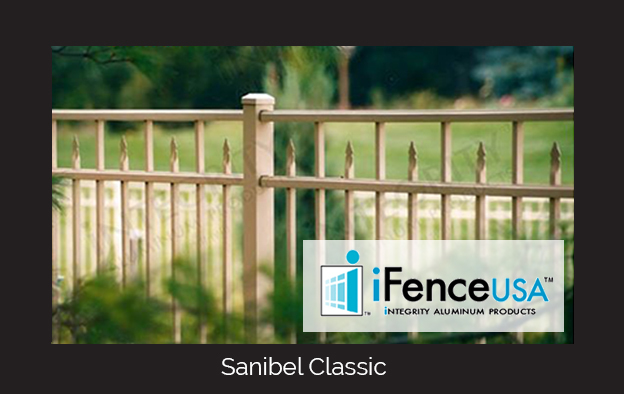 iFenceUSA offers wholesale pricing on aluminum fence panels while offering exceptional customer service. From planning, measuring, selecting, and installing your new aluminum pool fence we make the process simple for homeowners. 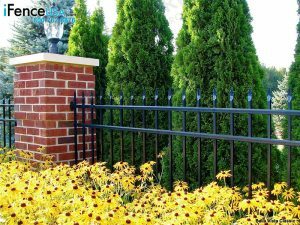 When you purchase online aluminum fence from iFenceUSA rest assured that your aluminum fence and accessories will come factory direct straight to your home with easy DIY installation instructions. Is Your Fence Eco Friendly? There are many areas where homeowners consider if their renovation is eco friendly however I bet when it comes to fencing most of us haven’t given it a second thought. Let’s get real, it isn’t the first thing that comes to mind like it may be when choosing decking materials, lighting, insulation, and so on but in reality, it is just as important. Not only will you find aluminum fencing to be a good choice for our environment there are many other advantages to choosing aluminum when looking into fencing materials for your home or business. There are a number of home remodeling products that come with the eco-friendly label. In part this is done to offer a bit or reassurance to companies and clients alike that they are doing what is right for Mother Nature by making this exact purchase. Not only is important how your purchase affect the environment it is crucial that they are also useful to you and meet your needs better than other options available to you. There are a number of ways that are straightforward and simple to implement when it comes to eco-aware however, it can be a bit more difficult in larger investments for around your home such as the purchase of a new fence and gate. There are a number of materials that fencing is created from. Popular options throughout history have included chain link, wood, vinyl, wrought iron, electric, and aluminum. Wood is an obvious eco-friendly material in fencing however, wood fences come with a number of drawbacks as well. Unlike aluminum or other metal fencing wood needs constant maintenance and is not known for longevity. Vinyl fence is far from eco friendly as it is created with a number of chemicals. Classic black wrought iron fencing is a popular and eco-friendly option however it can be quite costly. Aluminum is a less expensive, equal quality alternative. One of the most recycled materials is aluminum. Aluminum is used in a number of applications because it is not only lightweight it is easy to manipulate. Although lightweight is not something most of us would equate with strength in fencing it is important to note the strength comes from the grade of aluminum used and not the overall weight of the aluminum fence panel. Aluminum fence grades have been established to ensure customers get a fence that will meet the environmental requirements of its environment. Residential aluminum gates and fences will not see the same amount of traffic as commercial gates and fencing therefore it does not need to be as heavy duty thus the four common grades of aluminum fencing: pool/resort, residential, commercial, and industrial. Another benefit of aluminum vs wrought iron is the coating that is applied to keep it from oxidizing. Aluminum fence is powder coated which allows it to keep its look as it ages. A ten-year-old aluminum fence panel will look as good as a newly installed aluminum fence because of this unique powder coating. There will never be a need to repaint or stain your aluminum fence, this in itself is eco-friendly as well as consumer friendly. Less maintenance is always beneficial to busy homeowners. Aluminum fence panels are a great alternative to fencing for homeowners and business’s alike not only because of the many benefits such as durability, easy upkeep, quick installation, and so on but also because it is good for Mother Nature. When your fence has reached the end of its life cycle it is simply recycled into something new. There is a something to be said for coming home and relaxing in your backyard. The last thing you want when you are trying to wind down is to have to interact with your neighbors or view their unsightly idea of backyard landscaping. Your backyard space should be a sanctuary, a place where you can go to let go and unwind without anxiety. You should never feel like you are sharing your space. Your backyard is yours and yours alone. It is up to you as the homeowner to make the space your own little sanctuary. Bring privacy to your space can easily be done while improving the aesthetics and security of the space. Here are a few ways to “enclose” your backyard space for additional privacy. Enclosing your backyard space with solid walls is without a doubt the most effective way to increase privacy. Solid walls are quite expensive and can be a bit constricting if your space is on the smaller side. One way to avoid the constriction of solid walls is to add plants that cascade over the wall, aesthetic arbors, and gates can help create an airier sense to the enclosed space. If you are looking for a serious approach to security and privacy a solid wall is a great option. There are many types of landscaping materials that can help increase the privacy of your backyard. Consider the addition of large evergreens, hedges, arborvitaes, and vertical garden materials. These natural elements will increase the privacy of your landscape and create a living fence. The space will be inviting and natural. If you aren’t necessarily looking to increase the security of your yard and are just searching for a way to increase privacy vertical landscaping materials are a great natural border. Aluminum fencing is one of the most practical ways in which to increase the privacy of your backyard space. It is durable and practically maintenance free. Aluminum fence panels come in a number of sizes, styles, and colors. There are a number of decorative options to choose as well. Aluminum fencing is affordable, easy to install, compliments any space, and adds security. Any of these three options can provide homeowners a sense of privacy when relaxing in their backyard. The purpose of a backyard is to have a space that is all yours to relax in and enjoy, a space where the rest of the world and its noise is kept from infiltrating. It’s evident that winter is coming. The temperatures have dropped from the high seventies to the low fifties in just a week. Colder temperatures along with the extreme weather that winters here in Michigan bring can do some serious damage to the maintenance of your home and property, including the aluminum fence that encloses the perimeter of your home. During winter, perception is known to come down in multiple forms including rain, snow, sleet, and hail. We have been known to have a complete thaw one day and freezing ice and snow the next. Winters in Michigan can do some serious damage to your fence. To avoid this there are a number of precautions that can be taken to prevent damage to the fence come spring. Landscaping around the fence is one of the best things that you can do for your fence. Proper landscaping prevents the full weight of the snow from leaning up against the panels. It is also important that trees that overhang the fence are properly trimmed back. This helps to prevent tree limbs from falling on the aluminum fence. Snow and ice are heavy and can potentially fall on the fence and damage the panels. Properly trimming trees prevents this from occurring. Snow should never be allowed to pile up around the fence. One way to help prevent this is by removing the build up of leaves and debris from around the fencing panels in the fall. Without the leaves sitting up against the fence collecting moisture, going through the freeze thaw process, the fence should stay in good condition. Leaves lock in moisture which causes fence damage, warping, and rust. Maintenance throughout the winter is always necessary as snow should always be moved away from the fence using a rake or shovel. Without the snow built up around the fence it can evenly melt and allow the fence to uniformly dry out. Maintenance is a key element in keeping your home in top shape. The same is true of your aluminum fence. If you begin to notice small damage to the fence be sure it is quickly taken care to prevent further, bigger issues down the road. If there is damage to the posts they can quickly become weakened and may not withstand the shrinking and expansion that comes with the freeze and melt of the winter weather. Repairs and maintenance need to be kept up on to prevent small repairs from becoming major problems down the road. A four-foot-tall aluminum fence in white, adorned with circles offers a contemporary design to enhance the clean look and feel homeowners are looking for in a backyard oasis. A six-foot-tall, classic black aluminum fence with an added dual driveway gate offers sophistication and style to regal, two story colonials in brick. 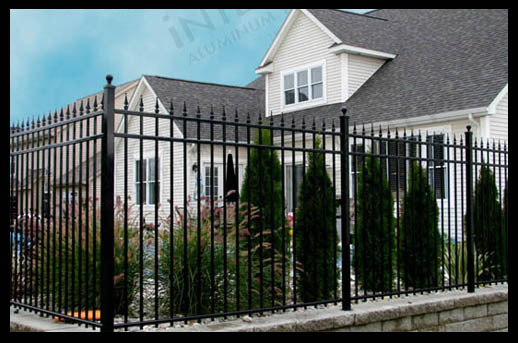 Aluminum fencing offers several unique design options which offer homeowners a way to individualize their unique story. The height of your home’s aluminum fence is one of the more critical choices you will make when selecting your new fence. The height of your homes fence will depend on the job that it needs to perform. Aluminum fencing used around the perimeter of a pool must be four feet or higher other than that the only other regulations you need to consider is those in place by your HOA and local municipalities. If a fence is only for aesthetics you can literally choose any height that is offered for sale, from three feet to twelve feet. Are you using the fence to keep children or pets inside the yard? Is the fence being added for additional safety, to prevent unwanted visitors? Maybe the fence is purely for aesthetics. Whatever the reason, iFenceUSA has a fence that meets your height requirements. Another choice that homeowners need to make is when selecting the grade (thickness of aluminum) of fencing. It may seem obvious that homeowners would choose residential grade aluminum fence however that is not always the case. The grade of fencing not only determines the strength and thickness of the aluminum that is used in your fence but also the size of the individual pickets, and then length of the aluminum fencing panels. 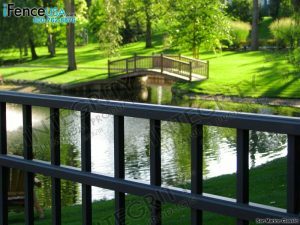 iFenceUSA offers eighteen unique options of aluminum fencing to choose from including popular options The San Marino, a flat top aluminum fence style and The Bella Vista, a simple and elegant spear top style. There are three major options when it comes to aluminum fence styles: flat top, exposed spears & finials, and flat top with spears. The most popular style in aluminum fencing which covers the pickets so that there is nothing left above the top flat railing. This style offers a more decorative option for aluminum fence. The pickets are spruced up with a variety of ornamental styles of finials, spears, butterfly scrolls, and circles. 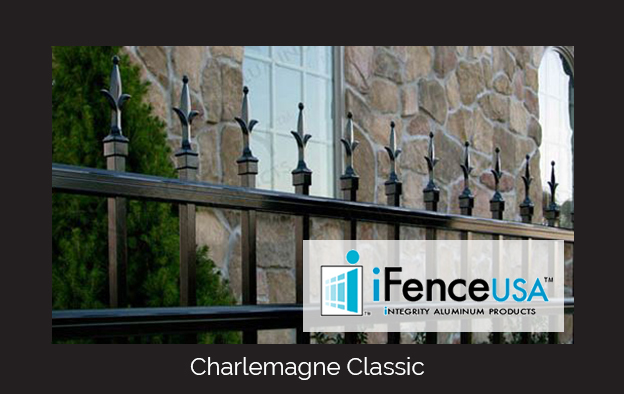 Aluminum fencing that offers homeowners a combination of elegance with ornamental option with a subdued flat railing. One of the last but important decisions homeowners will make has to do with the color of their new fence. 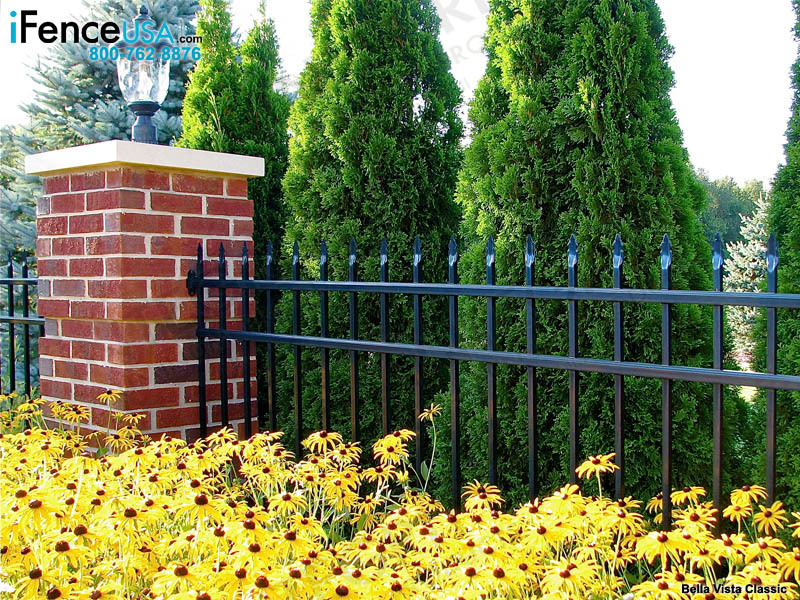 Black aluminum fence panels, both matte and glossy, are the most popular option for homeowners. 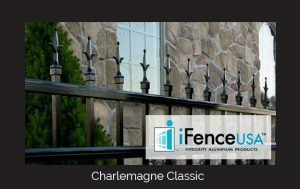 iFenceUSA offers nine color choices when picking out your new fence including: Matte bronze, Bronze, White, Matte White, Green, Beige, Matte Sandstone, Black, and Matte Black. When choosing a color for your fence consider the color and style of your home, choose a color that will compliment your home and matches its style.